Are you looking to increase your advertising reach? Read on to learn more about how digital advertising can do just that. Coversation Before we begin, we’ll chat about your goals, who you want to target, what you’re advertising and your what budget is. Campaign Development From our conversation we’ll able to create a campaign that places your ads directly in front of your target market. We can create a general advertisement about your products or services, or we can use a different approach. An approach that has more meaning. To do so we would create an educational and informative piece of content for your target market that is related to your product or service. The goal would be to develop more trust and credibility and in the end, keep people on your website longer. Banner Ad Design Your ads will need to stand out from the noise. We’ll ensure your ads are engaging and visually appealing. Landing Page Design Driving traffic to your site is one thing. Keeping them there and generating leads in another. That’s why we’ll create an effective landing page that will generate more leads and clients for your business. Tracking All campaigns need tracking. Thanks to Google Analytics we’ll be able to track the effectiveness of your campaign and make any adjustments as we go along. 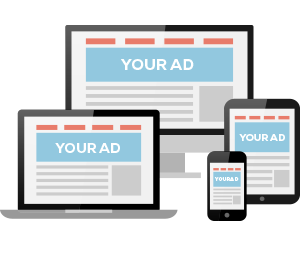 Call us at 250-217-4176 or contact us below to take the first step to setting up your digital advertising campaign.